The Middle East and North Africa region contains about half of the world's proven reserves of oil and natural gas. This has already proven to be a mixed blessing for economic growth in the region, and in a world economy where many countries are making efforts to reduce carbon-emitting sources of energy, a dependence on production of fossil fuels will be even more problematic. Abdelhak, Bassou, Mario Filadoro, Larabi Jaidi, Marion Jansen, Yassine Msadfa, and Simone Tagliapietra consider these isues in "Towards EU-MENA Shared Prosperity," a report recently co-published by the European think tank Breugel and the Moroccan think tank OCP Policy Center (which receives funding through Office Chérifien des Phosphates, a Morocco-based mining company). The report offers a reminder that while oil and gas money is intertwined with the economy of the Middle East and North Africa region, the energy resources are not evenly distributed across countries. 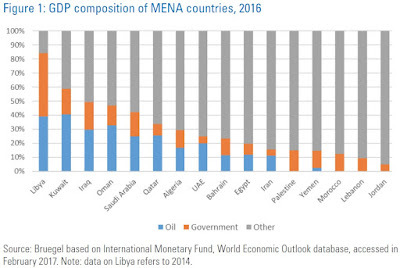 Countries like Libya, Iraq, and Saudi Arabia are highly dependent on oil, while others like Egypt and Jordan are actually oil importers. For the oil-rich countries of this region, oil tends to be a very large share of government revenues and of exports. In Saudi Arabia and Kuwait, more than 60% of the citizen workforce (that is, not counting immigrant workers from other countries) work in the government sector. But countries that are heavily dependent on natural resources, and especially oil reserves, have often found themselves without much economic growth. Around the world, Nigeria, Angola, Venezuela, and Saudi Arabia have examples of some extraordinary wealth for the few, but it's hard to make the case that This pattern is so common that it is sometimes called the "natural resources curse" or the "Dutch disease," after Netherlands experienced a slowdown in economic growth after tapping into North Sea natural gas resources. For an overall discussion, I recommend the article by Anthony J. Venables,"Using Natural Resources for Development: Why Has It Proven So Difficult?" in the Winter 2016 issue of the Journal of Economic Perspectives. Or you can check an earlier blog post on the subject, "The Natural Resources Curse" (October 27, 2011), discussing an article by Jeffrey Frankel. 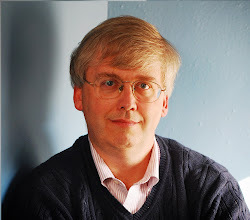 "Richard M. Auty (1993) formulated the Resource Curse Theory to describe the reasons why natural resource-abundant countries often perform poorly in economic and political terms. He claimed this can happen for several reasons, such as the presence of weak institutions, commodity price volatility, conflicts and the so-called ‘Dutch disease’ – a perverse mechanism by which the increased revenues from natural resource discoveries lead to appreciation of the local currency, thus negatively affecting the exports of all other sectors in the economy." The RST [rentier state theory] was first postulated by Hussein Mahdavy in 1970, in the context of a discussion on the evolution of economic development in the Middle East in general, and in Iran in particular. Mahdavy (1970) defined as rentier states those countries that receive on a regular basis substantial amounts of external rents, which have little to do with the production processes in their domestic economies. Building on Mahdavy’s seminal study, Hussein Beblawi and Giacomo Luciani in 1987 systematised the RST, and developed it into a widely-accepted tool to interpret theMENA political economy and – more broadly– the political economies of all the world’s oil-producing countries ... As Hvidt (2013) outlines, MENA rentier states easily give up their well-argued and planned policies when under pressure and fall back on established ways of doing business, namely through patronage and the predominant role of the public sector." The combination of these factors creates some unpleasant economic patterns behind. In the long run, productivity growth is what improves the standard of living in an economy. 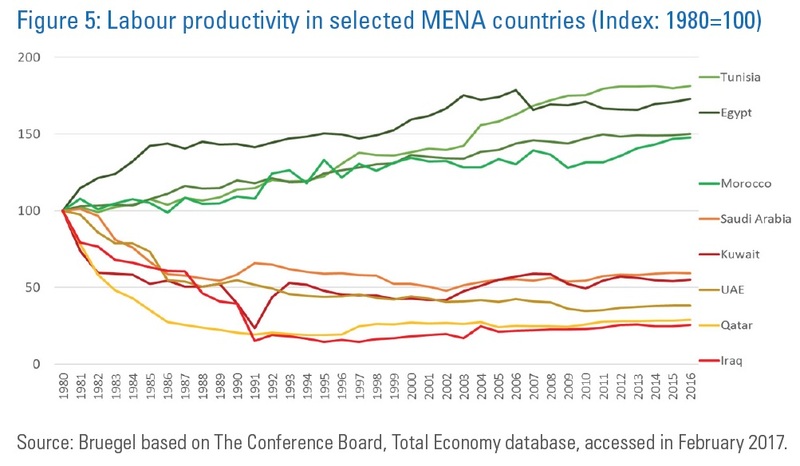 But as the figure shows, countries in the Middle East and North Africa region that export a lot of oil have typically seen a decline in productivity growth since 1980, while those with little in the way of energy resources have tended to see a rise in productivity. Energy resources are not inevitably a curse--as Venables and Frankel explain in the articles mentioned above--but with a rentier state and an otherwise weak economy, they can be. The pressures to find substitutes for fossil fuels are on the risk. Production of fossil fuels outside the Middle East using unconventional methods like hydraulic fracturing are on the rise, too. Energy exports from the Middle East don't seem likely to vanish, but they also don't seem likely to grow, and oil and gas prices seem likely to remain low. The economic foundation of the Middle Eastern oil exporters is being shaken. Of course, these countries have been trumpeting plans for diversifying their economies for a long time, but without a lot of real effect. As the report notes: "However, it should be outlined that these kinds of economic diversification plans have been part of MENA oil exporters’ rhetoric for a long time. For instance, Kuwait’s government was already discussing the need for economic diversification during the 1950s. After 60 years, oil continues to represent more than 60 percent of Kuwait’s GDP, and more than 70 percent of its fiscal revenues." The report focuses on the possibility of generating an alternative source of economic growth for this region through participation in global supply chains. Why this approach? The countries that have experience growth "miracles" in recent decades (Japan, South Korea, China, and others) have typically done so with expanded exports. The typical pattern was that countries started in low-tech manufacturing (like textiles), moved up to intermediate level assembly lines, and then moved to higher-tech products like information technology. But this economic ladder of success may not function very well in the future. The difficulty is what Dani Rodrik has called "premature deindustrialization," referring to the fact that the low-tech manufacturing jobs that used to be a point of entry into the global economy are now being taken over by automation and robots. 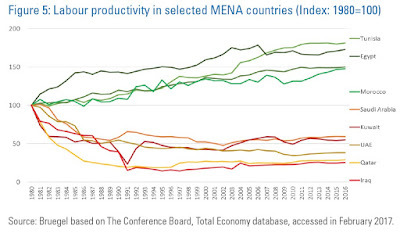 "A closer look at import and export flows of MENA countries suggests that MENA trade has at least two characteristics that do not put it in pole position for trade in the 21st century. First, the MENA region is characterized by an apparent lack of regional integration, which is important to attract foreign investment (ITC,2017). ... [E]xports and imports within the MENA region represent only 10% and 13% respectively of total flows. "An example of a sector with significant unexploited growth potential for the MENA region is fresh and processed food (ITC, 2016). Much of this is for trade within the region itself. Yet, the MENA region imposes, on average, the largest number of technical regulations on fresh and processed food imports – nearly four times more than other regions. Reforming those regulations could be very beneficial for the region." To put it bluntly, when countries can't find a way to trade food products with their nearest neighbors, their prospects for being a reliable part of farther-flung global supply chains seem limited. I have no magic answer for development priorities in this region. But as I've written before, population growth in this region means that there is a need for about 60 million new jobs in the next decade or so. The oil industry isn't going to provide those jobs, both because it won't be growing and because it's highly capital-intensive. Governments aren't going to be able to provide those jobs, because both oil-exporters and oil-importers of the region lack the resources to do so. There is a dire need for the development of private sector firms not focused on oil and gas. A basic and preliminary step for job creation would be to reduce trade barriers for trade within the region itself.